That’s when artist and journalist Erin Gallagher, who covers the protests for Revolution News, noticed something strange. The search results for #YaMeCanse were flooded with tweets that included the hashtag but no other content, save for a few random characters such as commas, semicolans, and angle brackets. A typical tweet might be: “,,> #YaMeCanse.” The accounts tweeting the empty content bore the telltale signals of spambots, such as a lack of followers and a tendency to tweet variations of the same thing over and over again. 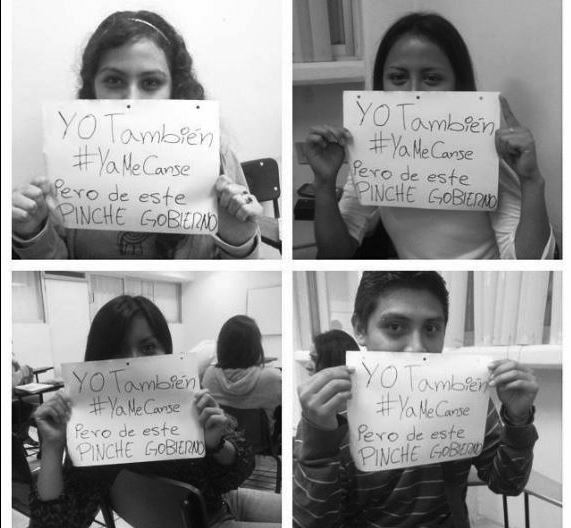 It became difficult, if not impossible, for activists to actually share information with each other through the #YaMeCanse hashtag, and as a result it quickly dropped out of Twitter’s trending topics. Bots, it seemed, had effectively jammed the protesters’ communications channel. Gallagher and LoQueSigue blogger Alberto Escorcia say the bots have followed protesters from hashtag to hashtag over the past few months, drowning out real conversations with noise. They’ve also seen similar bots create fake hashtags in apparent attempts to push real hashtags out of Twitter’s trending list, spread anti-protest messages, and even send death threats to specific activists. It might seem petty to worry about Twitter bots in a country besieged with violence and corruption, but social media has become a central part of activism throughout the world. When it is undermined it has real effects. Yes, the term “Twitter revolution” is a massive simplification of the uprisings in Iran in 2009 or the “Arab Spring” protests that spread throughout the Middle East in 2010. After all, massive protests, riots and revolutions are as old as civilization itself. But it’s fair to say that Twitter and other social networking sites have become the predominant platform for free expression throughout the world. And bots are now being used to stifle that freedom, not just in Mexico but around the globe. 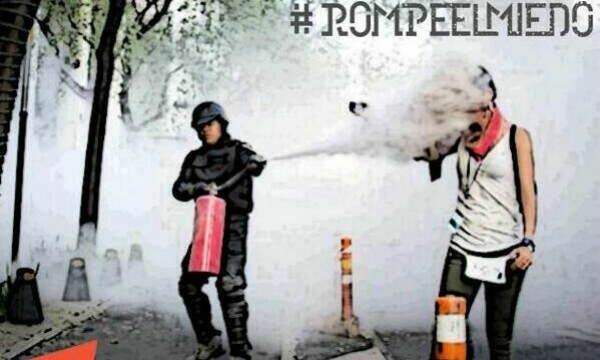 Similar tactics used against protesters in other countries, such as Turkey, Egypt and Syria. Just as the freedom of press was only truly guaranteed to those who could afford to buy one, freedom of social media may soon be limited to only those who can afford to build bot armies. Escorcia has been watching the rise of Twitter bots in Mexico since the 2012 elections, when he noticed fake accounts promoting the candidacy of Enrique Peña Nieto, now the president. 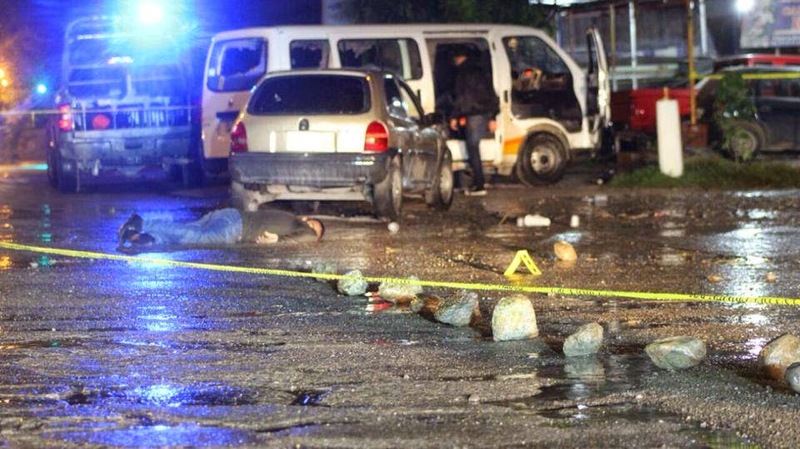 But the bots have become more active since the disappearance of the Ayotzinapa students. Using social network visualization tools such as Flocker and Gephi, Escorcia has discovered a reliable way of detecting bot accounts by examining the number of connections a Twitter account has with other users. Bots have few connections, while real users tend to have far more. Using the software, he’s been able to identify many cases of bots used to sabotage protests. That said, Monroy confirms that politically motivated spam bots exist and pose real problems for activists, particularly when they flood hashtags with useless content. These efforts can have material effects on organizers. 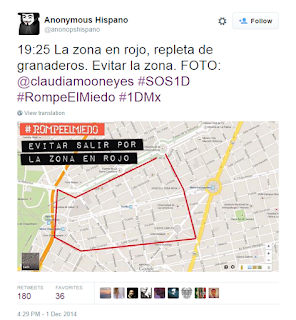 For example, Gallagher reports that as police dispersed a protest in Mexico City on December 1 of last year, protestors used the hashtag #RompeElMiedo (“break the fear”) to share information about police locations so that protesters, journalists and bystanders could exit protest without being arrested or beaten. One protester posted a map highlighting an area to avoid in particular, but Gallagher says that Twitter accounts behaving in exactly the same way the #YaMeCanse spammer did made it extremely difficult for protesters to find that map. The result was that they were more likely to end-up being beaten or jailed. The bots also make it more difficult for information to reach the public. For example, in February, activists used the hashtag #Acapulco to share photos from a protest in Acapulco, Mexico but the hashtag was pushed off the Twitter trending list by another hashtag, #SoyAmanteDe (“I am a lover of”), that Escorcia believes was created and promoted by bots, based on his analysis of the connections—or lack there of—between the bot accounts and other Twitter accounts. Tellingly, many of the #SoyAmanteDe Tweets used the same words, but in different arrangements, Gallagher reports. Most chillingly, Gallagher says that activist Rossana Reguillo received death threats, including photos of charred bodies, over the span of two months, via Twitter bots. So the question remains: who is running these anti-activist bots? Gallagher says that because of their appearance during President Peña Nieto’s campaign the bots are commonly referred to as “Peñabots,” and the ongoing assumption among activits on Twitter is that the federal government is behind the current crop of bots. Escorcia hasn’t been able to find any hard evidence linking the bots to the federal government in general, or to Peña Nieto in particular, but Gallagher points out that the bots seem to specifically target anti-government, as opposed to anti-cartel, sentiment on Twitter. That's true. good comnent. As long as people look up to these mensos the situation will be the same. I watched "el senor de los cielos" to see what the big fuzz was about and it was relly exaggerated. They made Amado Carrillo tall ,handsome and strong. in all the pictures that I seen from him he is the total opposite. lol also "el cochiloco" who is really fat and ugly butnot on t.v. lol The only actor that looked almost exacly the same was Pablo Escobar novela. Hey Lucio, great post, it is the most important post on BB for the past week or more, yet I am willing to guess few of the keyboard narcos will comprehend the meaning. 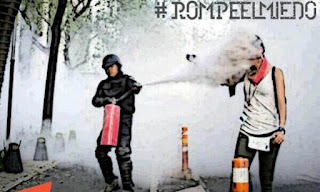 EPN manipulating social media to confuse people and control citizens and social activism. This is huge. EPN will not comment on the story. TOO MANY IDIOTS ON BB. But then people hate chapo for doing what he does and these Mexican politicos do worser than him. Is there an app to fight these pesky bots! Chapo and the politicos are the same people they sleep together.just write to him and tell him you fell head over heels for him already stop making excuses! EPN dragging his tail to cover his tracks. No shame where money and power are involved. Asi es. Muy bien dicho 11:32 PM! Pa' la fregada con EPN. Who would have thought!, all, or at least most "users" supporting Peña at youtube, twitter and so on have been bots all along, they are effective because they are always alert and ready to deploy their fake armies, bit easy to spot by behavior alone. Mexico has many criminals involved in government...don't badmouth mexico!!! ...don't badmouth veracruz, no lo voy a permitirrrr, jams de los jamases!!! Nunca! Eso no lo voy a tolerar! "Portense bien, por favor, despues no acusen..."
--Just 3 examples of lo que no te quepa o lo repartas, do not split your sins around, fools!! !